"More than three decades after its premiere, Follies remains the most elusive of landmark Broadway musicals. Set at a reunion of onetime Follies performers on the eve of the destruction of their old theater, it is a show for which the word 'problematic' could have been coined. Its theatricality is lavish but its mood is downbeat. Its storytelling plays tricks with time that are poetic to its fans but disorienting gimmicky to less sympathetic onlookers. The principal characters are narcissistic, unpleasant and prone to on-stage nervous breakdowns. Yet the Stephen Sondheim songs they sing are now classics of the musical theater repertoire, full of heart even when they delineate disappointed lives." That's how Frank Rich, former NY Times drama critic, introduces EVERYTHING WAS POSSIBLE--THE BIRTH OF THE MUSICAL FOLLIES by Ted Chapin (Applause Theatre & Cinema Books). Originally published by Knopf in 2003, the book has been recently reprinted in a trade paperback edition and contains a slew of photographs, many of which were personal shots taken by Chapin when he was a college-age production assistant on the 1971 show. Chapin wisely took notes while working as a gofer; thirty years later he turned his notes into a richly informative, compelling book. "I have nothing but admiration for the artists who created Follies...I discovered they were all people with foibles--which shouldn't be a surprise, though to a wide-eyed potential groupie, it was. Watching them work hard to create something a little different from anything that had come before was seductive," Chapin explains. "At every stage there was someone on the creative staff who was miserable." How co-directors Hal Prince and Michael Bennett, writer James Goldman and composer Sondheim managed to overcome their personal demons-- and at times intense dislike of each other-- makes for a cautionary yet inspiring story. Like the characters in the musical who keep changing all the time and reconciling themselves to life's disappointments, Follies' creators, aided by the significant contributions of the cast (Alexis Smith, Yvonne DeCarlo and Dorothy Collins, among others), not only managed to overcome all obstacles but produce a ground-breaking, prize-winning, long-running musical. 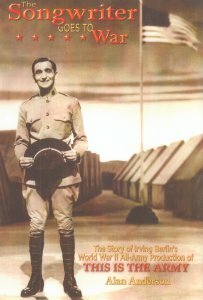 THE SONGWRITER GOES TO WAR--THE STORY OF IRVING BERLIN'S WORLD WAR II ALL-ARMY PRODUCTION OF This Is the Army is another backstage book written from the perspective of a fly on the wall. Author Alan Anderson (son of dramatist Maxwell Anderson) was a young sergeant when served as stage manager for the 1942 show which had one of the most remarkable opening nights in Broadway history. Originally slated to play a month and make a little money for the Army Relief Fund, Berlin's show kept running, then toured the country (pausing in Hollywood for the movie version), eventually heading overseas where it entertained frontline troops right up until the end of the war. Limelight has also released a new edition of THE FANTASTICKS--AMERICA'S LONGEST-RUNNING PLAY by Donald C. Farber & Robert Viagas. The musical by Tom Jones & Harvey Schmidt opened in 1960 and ran for another 42 years before closing Off-Broadway. It is anything but dead, though, with regional and touring productions still delighting audiences of all ages and nationalities. A tale in praise of storybook romance--ridiculous but endearing--THE FANTASTICKS is one of showbiz's miraculous success stories, and makes for uplifting reading.